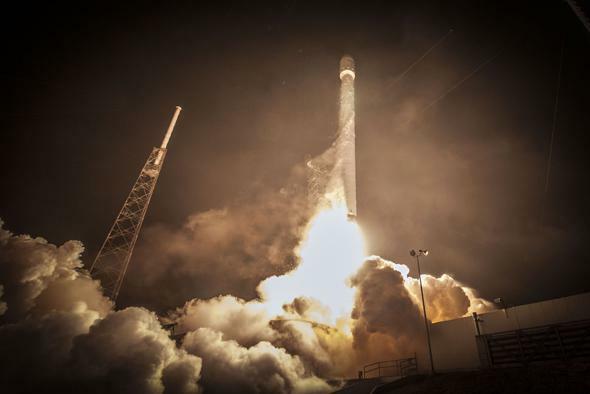 SpaceX return to flight planned for Dec. 19, 2015. A Falcon 9 launch from March 2015. Click to vonbraunenate. “Monte Carlo” is a type of statistical analysis that generates lots and lots of scenarios and then uses them to calculate the odds of an outcome. A 10 percent boost in relanding the first stage rocket is, apparently, significant enough to delay the launch. The launch will now be scheduled for an instantaneous window (see below) at 8:33 p.m. Eastern time (01:33 UTC) on Dec. 21. Update to the update (sigh): The launch window has been opened up and will extend for five minutes. Sunday night, SpaceX will attempt to launch a Falcon 9 rocket carrying 11 satellites into orbit around 8:29 p.m. Eastern (U.S.) time (01:20 UTC). NASASpaceFlight.com reports the time of launch is set at 8:29 p.m. This is an instantaneous launch window, which means they have to launch at that time, or they’ll have to scrub for the day. This is due to Federal Aviation Administration restrictions—they don’t want to reroute holiday flight traffic around Florida for the duration of a several hour launch window. I haven’t seen anything official, but I expect the launch will be carried on the SpaceX Livestream feed. You can always try NASA’s HD stream, too. Besides carrying the 11 ORBCOMM satellites, this mission is exciting for two reasons: It’s the return to flight for SpaceX after the loss of a rocket in June, and—as Musk tweeted—after the launch they will also be attempting to land the first stage booster back at the launch pad. It will be the company’s first try at relanding the booster on dry land; all previous attempts have been at sea. None has been successful, in the sense of the booster landing and remaining upright, but each was a remarkable engineering feat in getting it to the floating landing platform at all. I would assume that the lessons learned from those tests are why SpaceX is confident enough to try a literal landing this time. In some ways it’s easier; the floating platforms can bob up and down in the water while land tends to be steady. But having something at sea means it’s farther along the launch path, so less fuel is needed to bring the booster back. However, this launch will be of the new “Full Thrust” version of the F9, which has added capabilities (more fuel capacity and reduced overall mass), so that should make it easier to get the booster back to the launch site. All in all, this is quite exciting, and I certainly hope all goes nominally. As a reminder, NASA just ordered from SpaceX a crewed flight to the International Space Station for 2017 (not-so-incidentally, Boeing just received their second order for a crewed flight, too), so SpaceX needs to show they can get this done as a necessary step along the way to that goal.